This is the second in the Quadtych series I plan on Egypt. 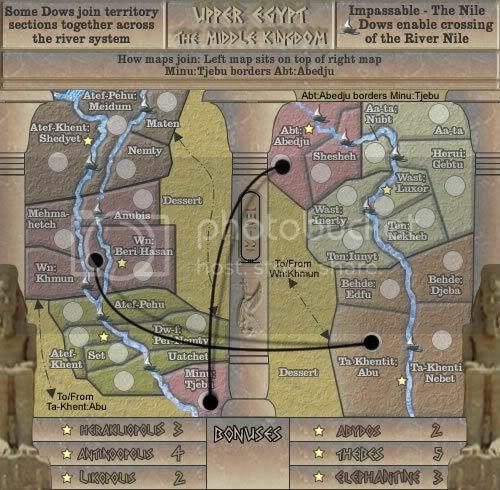 It is a continuation of the map recently started on Lower Egypt and has been started in the same graphical and gameplay position as where the Lower Egypt map is now up to. 1. The number of territories currently on the map. 2. The number of continents. Bonuses are on the mini map. 3. Descriptions of any unique features or areas. 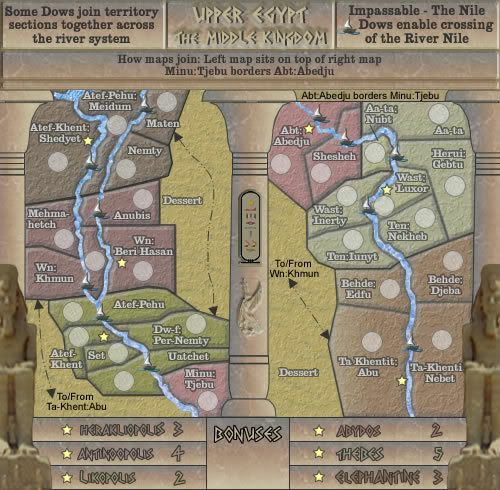 There are no particularly extraordinary features, except to say that the continents are named after re-knowned capitals for easy identification, and the territory names are from the 22 nomes of Upper Egypt, additioned to some of the major cities where two section of territory cross the river. The cartouche in the middle is the same cartouche for the mapmaker, the symbol used below that is the winged vulture goddess of Upper Egypt Nehkbet. Other Glyphs will be added. The columns will be style after the Lotus Flower columns prominent in Egyptian Architecture. Last edited by cairnswk on Wed Jul 02, 2008 3:28 am, edited 30 times in total. Way too much bevel on the Dow descriptions. Lighten that up. And what's with the b3swt Dessert? The Maten/Nemty border is nearly invisible if present at all. It'd be nice if the pharaoh statues didn't look so obviously c/p+blowup. Perhaps a sharpen mask or two? What's with the colons in some territory names? Some bonus colors are a little bit too close together, suggest some more differentiation. Complaints aside, I like the map. It's small and simple, and the very linear chokepoint nature of it should make for some interesting gameplay. I'm confused... how do you get from one side to the other? TaCktiX wrote: Way too much bevel on the Dow descriptions. Lighten that up. And what's with the b3swt Dessert? The Maten/Nemty border is nearly invisible if present at all. It'd be nice if the pharaoh statues didn't look so obviously c/p+blowup. Perhaps a sharpen mask or two? What's with the colons in some territory names? Some bonus colors are a little bit too close together, suggest some more differentiation. All done below in Version 2, with exception of the statues...I want to make them part of the design but not as images plonked on the map. Colon in tert names are where a nome name is combined with a city name for that region. if i use hyphens, there ends up being too many hyphens in the overall name, but if i come up with an alternative, i will use it to make it easier to understand. InkL0sed wrote: I'm confused... how do you get from one side to the other? i don't mean to be nasty Inklosed, but can't you read? lol even I got that!! Sorry for missing such a glaringly obvious note -- maybe you should make it a little less noticeable! Mmmmm. no-one interested in a continuation of this series???? 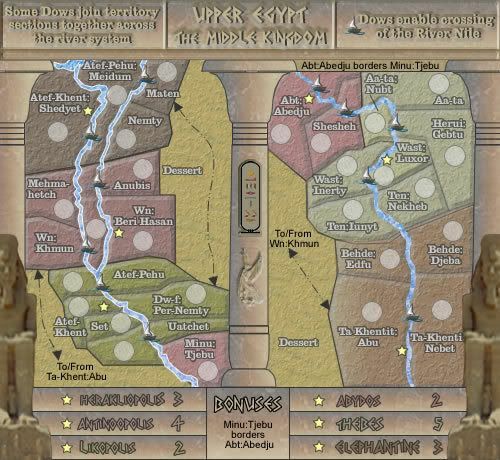 no offence, but the Egypt series doesnt appeal to me, i dont know why, the graphics are great, the gameplay is, but this one is just one that im not too excited about, maybe some gameplay twist? t-o-m wrote: no offence, but the Egypt series doesnt appeal to me, i dont know why, the graphics are great, the gameplay is, but this one is just one that im not too excited about, maybe some gameplay twist? Thanks tom...just wanted to make a few simple "classic" style maps....that's all...they'll be plenty more tricks to come i'm sure. cairnswk wrote: Thanks tom...just wanted to make a few simple "classic" style maps....that's all...they'll be plenty more tricks to come i'm sure. good, i do really love your maps, and i cant wait to play your WWII map, got no spaces though!! Gees...this looks as though it won't get past the first page. 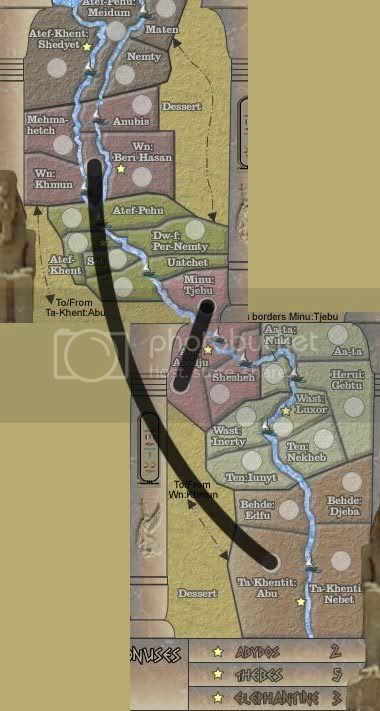 Wn:Khmum can attack Ta-Khent ? I guess thats right - but it took me a while to figure that out, I was following the arrow directions, which threw me. Sorry Carins. 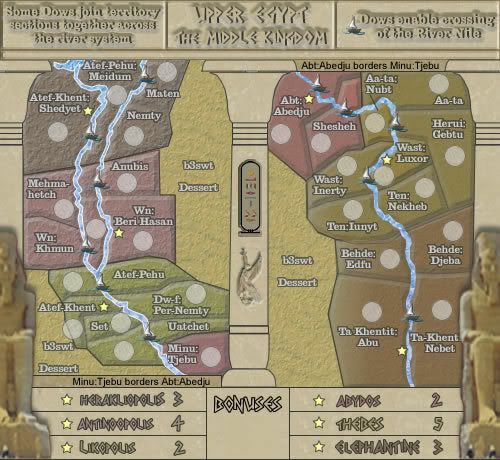 However, If you dress up those statues on the far sides, the map will be ace. Great colors and you are nailing the Egypt theme. I'm still not so sure about the bevel on the text at the top. It is readable, but I think it could be better. OK, if you're confused, then i'll have to simply detail that border adjoining better in the legend. I guess Anubis owns the middle island part, thou Anubis then has 2 army shades! 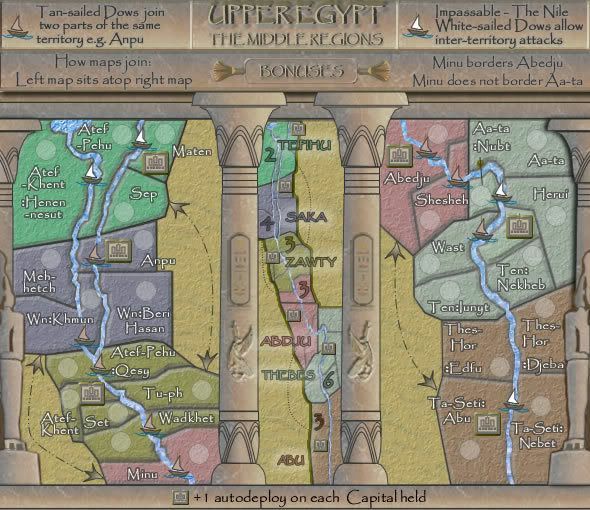 Or name "Wast: Luxor" Thebes or rename the continent Luxor? 1. I made the territory borders thicker. 2. there is notation in the legend on how the maps join. I know it is difficult for some people to put one and one together, but please do try. cairnswk wrote: I know it is difficult for some people to put one and one together, but please do try. I am trying. But you've confused me even more. See the connectors I've added to your map below. Is this right? yes but i wasn't refering 2 u specifically....i was refering to the general populous...sometimes i think some out there are pretty ?....well you know. 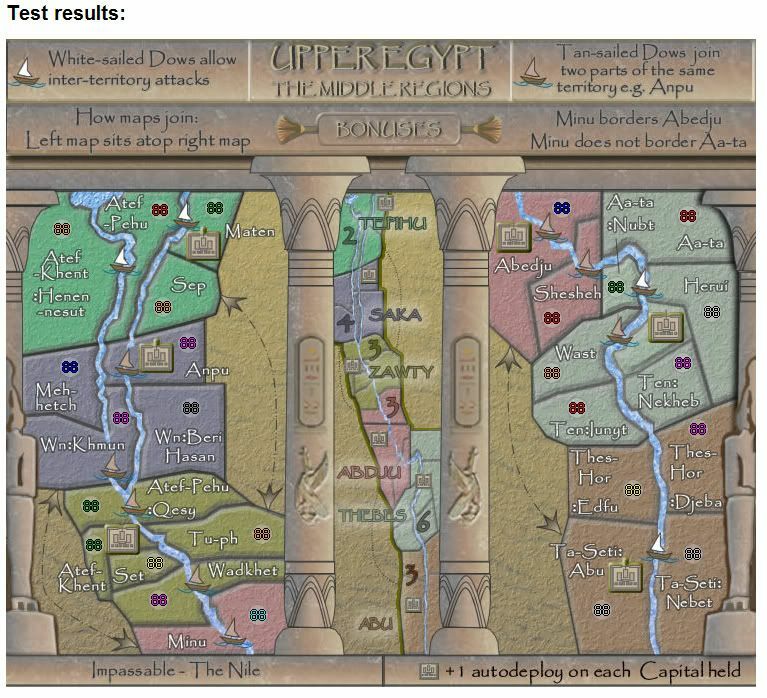 this is the only way I know how to do such an elongated map....without turning it on its side. Ahh... When you said "Left map sits on top of Right map" that is what confused me. I was thinking that it was like a 2nd layer "on top of" the first layer, like a downstairs and upstairs. This makes more sense to me now, and now I can see why the arrows are pointing to where they are... (Sorry it took me so long to get that). cairns - are you going to use the new "[bigIMG]" codes? yes...but i don't know if that will allow us to use this facility in the map play area. I';ll check it out. I think one only needs to use this on the large versions in Firefox. I ruin both FF and IE, and it certainly doesn't work in IE7. As for the map play situation, this facility does not apply there so there is no change to map size (for play) restrictions. RjBeals wrote: This makes more sense to me now, and now I can see why the arrows are pointing to where they are... (Sorry it took me so long to get that). Rj....no worries, sometimes some things just don't click straight away. If i had the option of doing the map any other way, i would, but as you can see it is a large long map. what is this map play area? my reference to the map play area simply is the screen area when you have a map in play. This is different from the forum than we are in now.